Extreme weather events and costs associated with climate change are occurring across the world. Deadly tornadoes swept across the US midwest for the second time in a month on May 23, causing damage from Wisconsin to Texas and killing at least 91 people. In Joplin, Missouri, 89 people were confirmed dead, but authorities warned that the death toll could climb as search and rescuers continued their work. The twister cut a path nearly 10 kilometres long and more than 800 metres wide through the centre of town. A state of emergency was declared. 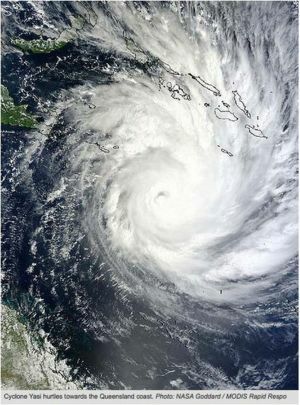 Tropical Cyclone Carlos lashed Darwin on 15-16 February 2011. 400 millimetres of rain fell in 24 hours and winds in excess of 100 kilometres per hour knocked down trees and powerlines across the city.. Main roads have been cut by floodwaters and a 6.6-metre high tide is expected later Wednesday. On 4 February 2011, bitterly cold temperatures set in across the United States following a massive storm which dumped snow, ice and sleet over a 3,000-kilometre stretch from Texas to Maine. The storm - one of the largest since the 1950s - killed dozens and affected around 100 million people. The cost of rebuilding Pakistan after its devastating 2010 floods could exceed $10 to $15 billion. These floods have affected 20 million people. AUS$20 to AUS$40 million just to rebuild the roads and bridges after the 2007 Gippsland flood. This page was last modified 01:33, 24 May 2011. This page has been accessed 30,727 times.